Shahriari, H., Maddahi, A., Shokouhi, A. (2009). A Robust Dispersion Control Chart Based on M-estimate. Journal of Industrial and Systems Engineering, 2(4), 297-307. Hamid Shahriari; Alireza Maddahi; Amir H. Shokouhi. "A Robust Dispersion Control Chart Based on M-estimate". 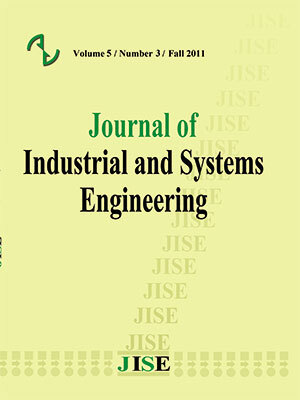 Journal of Industrial and Systems Engineering, 2, 4, 2009, 297-307. Shahriari, H., Maddahi, A., Shokouhi, A. (2009). 'A Robust Dispersion Control Chart Based on M-estimate', Journal of Industrial and Systems Engineering, 2(4), pp. 297-307. Shahriari, H., Maddahi, A., Shokouhi, A. A Robust Dispersion Control Chart Based on M-estimate. Journal of Industrial and Systems Engineering, 2009; 2(4): 297-307. Process control charts are proven techniques for improving quality. Specifying the control limits is the most important step in designing a control chart. The presence of outliers may extremely affect the estimates of parameters using classical methods. Robust estimators which are not affected by outliers or the small departures from the model assumptions are applied in this paper to specify the control limits. All the robust estimators of dispersion which have been proposed during the last decade are evaluated and their performance in control charting is compared. The results indicate that the M-estimate is a better estimator of dispersion in the presence of outliers. We show that when the M-estimate with a bisquare ρ -function is used to estimate the dispersion, the S control chart has the best performance among all estimators. Grant R., Leavenworth R. (1996), Statistical quality control; 7th edition, McGraw-Hill; New York. Huber P.J. (1981), Robust statistics; Wiley; New York. Janace G.J., Meikle S.E. (1997), Control charts based on medians; The Statistician 46(1); 19-31. Rocke D.M. (1989), Robust control charts; Thechnometrics 31(2); 173-184.